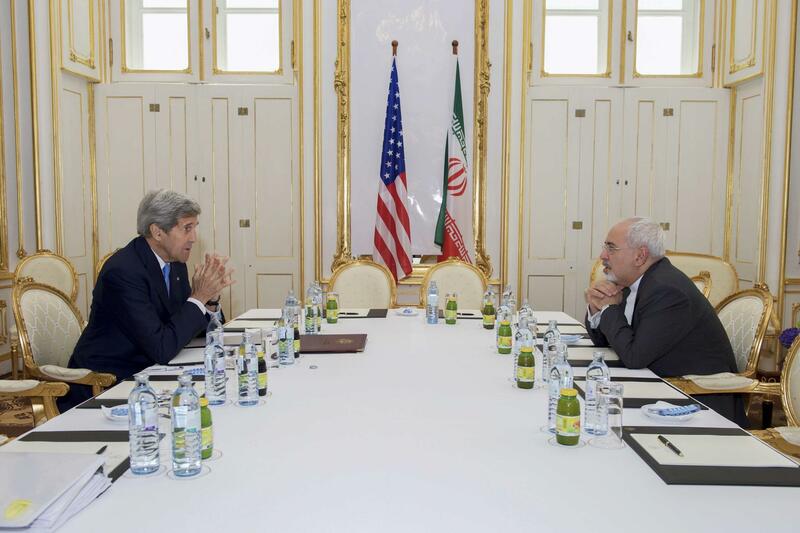 Former Secretary of State John Kerry (left) met with Iranian Foreign Minister Javad Zarif at a hotel in Vienna, Austria in June 30, 2015. WASHINGTON — John Kerry’s bid to save one of his most significant accomplishments as secretary of state took him to New York on a Sunday afternoon two weeks ago, where, more than a year after he left office, he engaged in some unusual shadow diplomacy with a top-ranking Iranian official. Kerry also met last month with German President Frank-Walter Steinmeier, and he’s been on the phone with top European Union official Federica Mogherini, according to the source, who spoke on the condition of anonymity to reveal the private meetings. Kerry has also met with French President Emmanuel Macron in both Paris and New York, conversing over the details of sanctions and regional nuclear threats in both French and English. The rare moves by a former secretary of state highlight the stakes for Kerry personally, as well as for other Obama-era diplomats who are dismayed by what they see as Trump’s disruptive approach to diplomacy, and who view the Iran nuclear deal as a factor for stability in the Middle East and for global nuclear nonproliferation. The pact, which came after a marathon negotiating session in Vienna that involved Iran and six world powers, lifted sanctions in return for Iran stopping its pursuit of nuclear weapons. Kerry declined to be interviewed for this story. The quiet lobbying campaign — by him and others — is being conducted below the radar because he and his allies believe a high-profile defense of the deal by prominent Democrats would only backfire and provoke Trump, making it more likely the president would pull the United States out of the deal. Moniz was a key part of the negotiating team, meeting with his Iranian counterpart as they determined some of the technical scientific details. 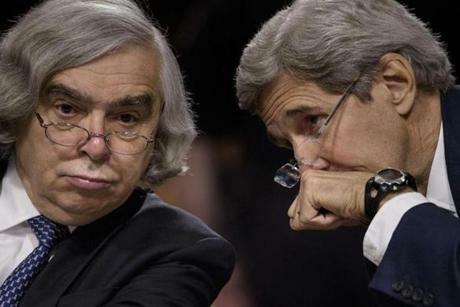 John Kerry (right) whispered to former US Secretary of Energy Ernest Moniz during a hearing of the Senate Foreign Relations Committee on Capitol Hill in July 23, 2015. A former Obama White House official said there is little to be gained by aiming the effort directly at Trump. Democratic lawmakers in Congress also have been relatively quiet, and not all share Kerry’s belief that the deal is essential for preventing a nuclear arms race in the volatile region. Kerry has quietly tried to bolster support in Congress. In recent weeks he’s placed dozens of phone calls and, often with Moniz by his side, has lobbied members of Congress, including House Speaker Paul Ryan. While he is not negotiating as he did as secretary of state, he is attempting through quiet advocacy to preserve what he accomplished. Kerry supporters see in this campaign some of his trademark traits, especially his unflagging energy even in the face of potential failure. Critics see something else, a former office holder working with foreign officials to potentially undermine the policy aims of a current administration. Under terms of the deal, the United States is supposed to waive sanctions, which come up for review every three or four months, as long as Iran remains in compliance. Trump is threatening to reimpose sanctions on Iran when the next deadline comes on May 12, which would essentially mean the United States is pulling out of the deal. Trump has ridiculed Kerry for a deal that he says is not harsh enough on Iran, saying that inspectors should have broader access, portions of the deal should never expire, and that Iran’s ballistic missile program should also be curtailed. 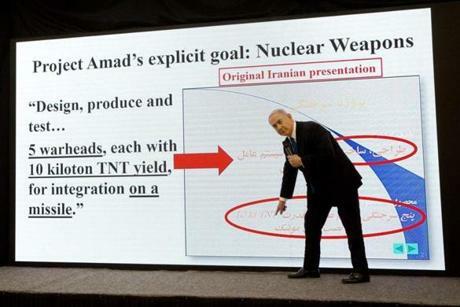 Israel Prime Minister Benjamin Netanyahu provided further ammunition for critics of the deal, unveiling documents that showed Iranian efforts to build its nuclear program before the 2015 deal was reached. Israeli Prime Minister Benjamin Netanyahu presented material on Iranian nuclear weapons development during a press conference in Tel Aviv last week. Kerry and others said the documents were nothing new, and illustrated the need for an inspections regime to make sure Iran is complying with the current agreement. Kerry is coordinating his push with a group of officials who were his top advisers at the State Department, and who helped craft and negotiate the Iran deal in the first place. The group, called Diplomacy Works, has an advisory council that includes lead Iran-deal negotiator Wendy Sherman, former State Department chief of staff Jon Finer, and former spokeswoman Jen Psaki. 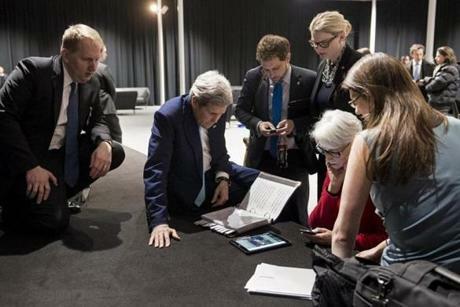 John Kerry (2nd left), US Under Secretary for Political Affairs Wendy Sherman (2nd right) and staff watched a tablet in Lausanne as President Barack Obama made a state address on the status of the Iran nuclear program talks in April 2, 2015. The group claims to be responsible for 100 news articles, 34 television and radio hits, and 37 opinion pieces on the Iran question. They do fact checks of criticisms of the agreement and blast them out to an e-mail list of nearly 4,000 policy makers and foreign policy experts. But the group determined that the most influential voices would not be Democrats, and instead would focus on Europeans, Israelis, and nonpartisan experts to try and salvage the deal, according to a person involved in the effort. As a sign of the their success, Kerry has pointed to an April 25 letter signed by 26 former top-ranking Israeli military and security officials urging the United States to stay in the agreement. They are not ignoring the domestic audience. Kerry’s activities could raise questions if they are perceived as a direct effort to counter current administration foreign policy. The Trump administration got entangled with controversy when Michael Flynn, the incoming national security adviser, tried to undermine Obama policies in the administration’s last few weeks. His actions appeared to some legal experts to violate the Logan Act, an obscure 18th century law meant to crack down on private citizens acting on behalf of the United States during a dispute with foreign governments. Stephen Vladeck, a law professor at the University of Texas, said the law is a red herring — since it’s never been used to prosecute anyone — and almost certainly would not apply to anything Kerry is doing. The president doesn’t listen much to the voices of the foreign policy establishment. And they don’t really know how to reach him through conservative media. A spokeswoman for Obama declined to comment on whether the former president is doing anything to preserve the Iran deal. Kurtzer said the most articulate public advocate for the pact right now is Moniz, although he said that the former energy secretary may not have the name recognition required to drive a national debate (Kurtzer himself initially could not correctly recall his name). Moniz declined several requests for an interview this week about his efforts. Public support for the deal was initially low, with nearly 60 percent of those surveyed in August 2015 saying they were opposed, according to a survey from Morning Consult. Those numbers are now reversed, with 56 percent supporting it; the number opposed, 26 percent, is the lowest level since the group began polling on the Iran deal. Democrats are strongly in favor, while Republicans are evenly split, according to the survey conducted from April 26 to May 1. Some on the left believe Trump has kept it alive for political reasons, to provide a convenient foil. “It’s something that has been in Trump’s cross-hairs even before he was inaugurated,” said the former Obama administration official. “That we’re in May 2018 and still in ‘will-they-or-won’t-they’ speaks to the utility the administration has found in the Iran deal. Otherwise they would have been out of it on day one.